Figure 4-18. 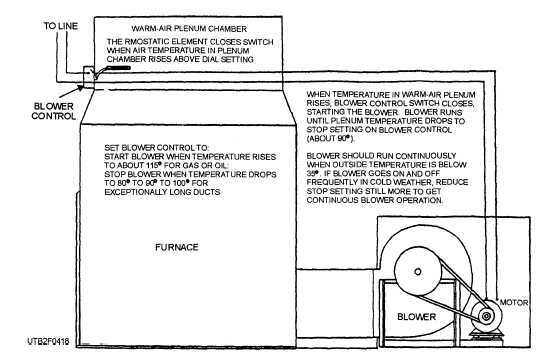 - Electrical circuit showing how blower control operates blower motor when temperature in plenum rises. Patterns of air distribution vary with the positions of supply diffusers. A diffuser that discharges through the floor in an upward direction or downward through the ceiling provides a vertical distribution of air. On the other hand, a diffuser that discharges through a wall provides a horizontal distribution of air. The spread for either the horizontal or the vertical pattern depends on the setting of the diffuser vanes. 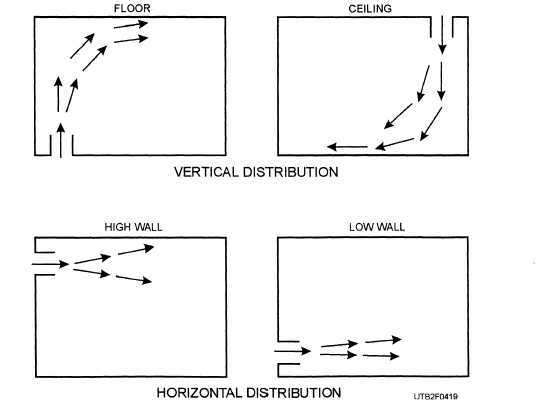 A low horizontal discharge provides the most effective distribution Airdistribution that results from different diffuser locations is shown in figure 4-19. Figure 4-19. - Air diffuser distribution.